This weeks “What’s Cooking Wednesday” post is a little different. 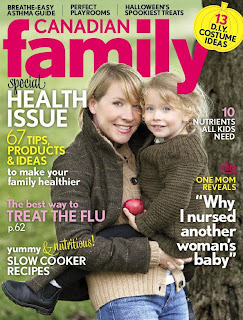 The recipe I’m featuring comes from one of my favorite magazines…..Canadian Family. I started subscribing to Canadian Family before Evan was even born. I loved the articles and that they have a feature called “Ages & Stages” that target a topic to different aged children. It’s definitely a magazine that will grow along with your family. Another awesome thing about Canadian Family magazine is that they have an active presence on Twitter. You can follow them by looking up @canadianfamily. I like to see publications embracing new social media outlets that allow them to be more interactive and informed about their audience. Anyhoo….enough about that on to the recipe. I asked permission to post this recipe in it’s entirety but unfortunately Canadian Family’s use rights would not allow it. I guess a link will have to do. Recipe Notes: Dewey and I both loved this recipe. It was very flavorful and makes a lot of food. Dewey and I both ate it the night I made it and then we had it for leftovers twice. I must admit that I completely forgot to do steps 4 & 5. I will try this next time because I did find the sauce a bit greasy since I didn’t drain the fat. Pick up the October Issue if you like Slow Cooker Recipes because they have a whole section of recipes including one for Butter Chicken which is high on my list to try! 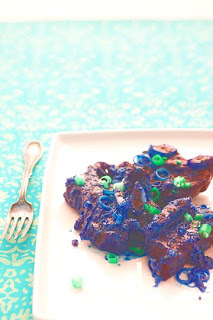 You can also check out their great Recipe archive on www.canadianfamily.ca. Don’t forget to see what else is cooking this Wednesday over at Shan’s!